Resources > articles > What is a UX Designer Responsible For? The UX designer role occupies an interesting place in business today. It is one of the most sought-after skillsets, particularly at product-driven companies, and yet many organizations seeking to hire UX designers have different (and sometimes inaccurate) ideas about what the role entails. Although the definition can vary, the fundamental focus of a UX designer (short for User Experience Designer) is on overall user satisfaction with a product. UX designers continually look for ways to improve how the product experience feels to the user — improvements such as making using the product faster, easier or more fun. Another way to think of a UX designer is as the user’s advocate within the product, making sure that each component of the product is in its most logical, easily accessible place and that any multi-step process within the product is streamlined and intuitive for the user. 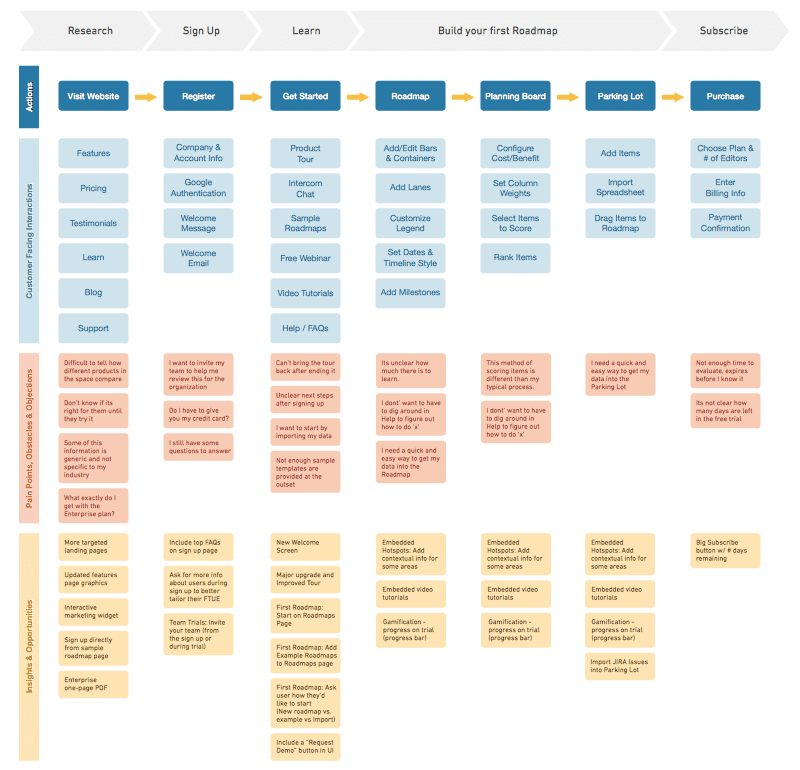 UX Designers may create customer journey maps like the one above to better understand the user experience. Journey maps show the customer’s interactions with the business over time and across service channels. What Does a UX Designer Focus On? Perhaps the best explanation of the UX designer’s areas of responsibility comes from Don Norman, a design consultant, author and one of the originators of the term UX. The user experience, Dr. Norman explains, entails everything that touches upon the experience with a product — even those parts of the experience that don’t involve actually using the product. With this definition in mind, in the case of a physical product, UX would therefore include the packaging, how easy it is to get the product into your car, and whether the pieces are laid out in the box such that the product looks easy or daunting to assemble. For software, the user experience would include how simple or complex the purchasing process is, whether product updates and patches are automatic or require the user to take action, and even how easy it is to explain to others what the product actually does. The UX designer’s focus, therefore, is around every way that a user might interact with a product, how each of those interactions might feel to the user, and how to improve them. The roles of UX designer and UI designer (short for User Interface Designer) are often mistakenly used interchangeably, partly because both roles are still relatively new and not fully understood. But they are not the same. Whereas a UX designer is responsible for creating the best possible overall product experience for the user, the UI designer’s responsibility is complementary and one level deeper — taking that overall user-experience directive from the UX designer and using it to visually lay out the details of the product. Why Should the UX Designer and Product Manager Be Different People? If the UX designer acts as a user advocate for the product, to make sure the customer has the best experience possible with it, why shouldn’t this just be another role for the product manager? After all, the PM’s job is to advocate for the best interests of the user, and she already has expertise in the product and the user persona? Although a good product manager will indeed act as the customer’s advocate when it comes to decisions about the product, that product manager is not necessarily an expert on user experience. This is a highly specialized skill set, requiring an individual devoted exclusively to understanding the product experience as a whole, and determining how every change to any portion of the product might create challenges for users in other parts of the product. Even a product manager with every intention of looking out for the best interests of the user will also have other, competing agendas to ensure a successful release of her product — including limited development resources and limited time to get the product to the market. This is why product managers and UX should work together to deliver exceptional customer experiences. Wherever feasible, a product team should have a dedicated UX designer focusing exclusively on how the product will feel to users.